Custom Redirects were launched in March 2012 and gave Blogger users the ability to change the permalink structure of the all types of pages on their blogs . It allows two kinds of redirects namely 301 Moved Permanently type (Which lets you pass SEO value) and 302 Moved Temporarily (Used for Coming Soon Pages or when a page is under maintenance ). This is extremely useful for people who are migrating from other platforms , as they can now easily able to redirect pages with different permalink structure than Blogger's default to a new page. Recently there have been some issues with it , which have become a cause of frustration for many users. When a Custom Redirect (example www.stylifyyourblog.com/contact ) is opened in a Mobile browser , it leads to a Redirect Loop (See Screenshot below) which doesn't allow the visitor to open the blog. 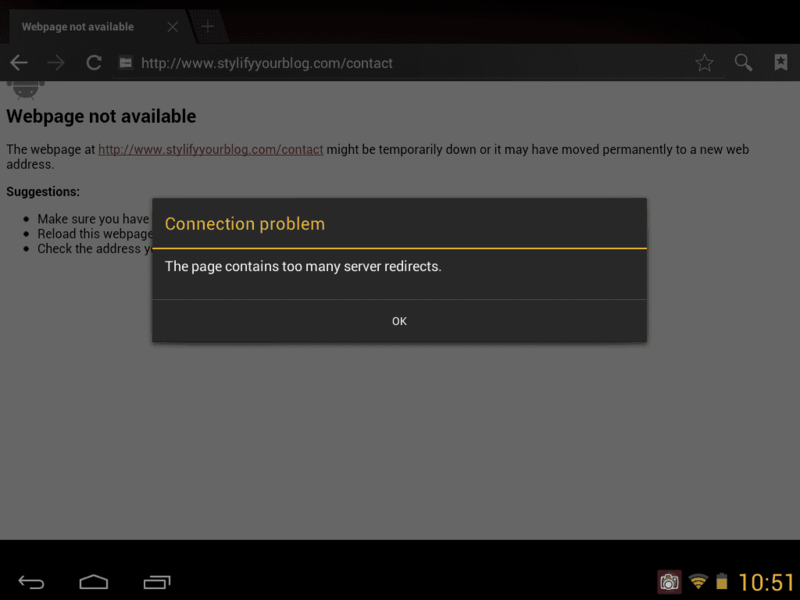 This becomes a big problem when the redirect is used on the homepage of the blog (example YourBlogName.blogspot.com or a custom domain like https://www.stylifyyourblog.com/ ) which makes it impossible for the user to even visit the blog. The main reason for this problem occurring is the mobile parameter that Blogger adds from the server side. The m=1 parameter interferes with the custom redirect and breaks the whole functionality (As you can see in the short GIF Below). Until last year if a custom redirect with mobile parameter was entered in a normal web browser (example stylifyyourblog.com/contact?m=1 ) it would lead to a 404 page , but this error was fixed by Blogger Team. I pasted the above code under the head tag, and replaced the addresses with mine. Am I missing something or putting it in the wrong place? It's taken forever for me to reply to this, but THANK YOU a million times over! ooh, I thought it worked for me, it is now showing my website on mobile view but it is also showing my blog now when I was trying to hide it i.e. I was trying to redirect www.jenmsmith.com to http://www.jenmsmith.com/p/life-coaching.html - any help appreciated! Thanks a lot! It really helped me. It works! Thank you so much for this!!! I recently started a new website for my business and was facing the same problem. I tried to redirect my domain http://earendilexports.com to http://www.earendilexports.com/p/welcome.html. I've followed the technique you suggested in the above post however it's redirecting only on the desktop version of theb site and not the mobile version. The code #39;?m=1' || window.location.href == '') appeares in red. Thanks!! my problem solved when i change from default redirect that the blogger offers and use this code instead. Thanks again!! In my application I wanted to use the redirect to be used to point to a 'fake homepage' for my blogger, however I also wanted people to be able to view my blog as normal. To workaround this I labelled all my blogposts with an arbitrary identical label and just set up a search for that label so users could view all my blog posts with that label. Thanks for the help Prayag!! But the mobile site does not show the static homepage.... A list of all my posts is shown instead.... Can I redirect mobile users to a static mobile-site homepage for my blog?? The page never gets loaded. Thank you. The second version of the amended code worked for us. That's a very handy fix! Hello, Thanks for the advice. I now understand why the problem occurs. I have a beginner question, do you need a rel canonical to tell google of the existance of your mobile site if the mobile site is placed in a subfolder of the main site ?